The league leaders and the champions played out an entertaining 1-1 draw in Munich. Bastian Schweinsteiger returned to the centre of Bayern’s midfield, while Jupp Heynckes selected Mario Mandzukic as his lone centre-forward. Mats Hummels, Ikay Gundogan and Mario Gotze all returned to Dortmund’s side after missing the 1-1 draw with Dusseldorf in midweek. This was an evenly-balanced game that went through various phases – the game started at a frantic tempo, then settled down into a tight tactical battle for the remainder of the first half, and then became more open after the break. Although there was nothing unusual about Klopp’s team selection, Dortmund lined up in a surprise shape. Rather than playing in his traditional right-sided position, Jakub ‘Kuba’ Blaszczykowski was tucked inside as a shuttler, with Gotze and Marco Reus on the flanks. Sven Bender was in a deep midfield role with Gundogan to his left. Blaszczykowski was probably fielded there in order to pick up Schweinsteiger, but Bayern’s midfield trio was fluid and often rotated around the pressure. The odd thing about the midfield battle was that while Bender started as the deepest of the three midfielders, he was often the one to push forward and press Javi Martinez when he received possession, with Gundogan staying deeper and Blaszczykowski on the wrong side of the pitch to help out. None of this really seemed to make sense – Gundogan’s role without the ball wasn’t clear, but everything was happening at such a quick tempo in the first 20 minutes that Dortmund seemed unable to adjust and shift towards the more natural format, which would have seen Gundogan pressing and Bender sitting. Or, if they preferred, the two could have swapped positions. It was simply illogical to have Bender making diagonal runs up towards Martinez, when he was supposedly occupying the space in front of the back four. The obvious beneficiary of this was Toni Kroos, Bayern’s number ten and one of the most intelligent players in Europe at finding space between opponents. Kroos needed no invitation to move between the lines – he was essentially playing there anyway, although he did place himself left-of-centre in the zone Bender should have been patrolling, and kept getting the ball in dangerous positions. After 12 minutes he sliced a wayward shot well wide, but already the pattern had become clear – Dortmund were pressing in midfield but leaving Kroos free, and neither of the centre-backs were keen to move forward and close him down. In all, Dortmund’s defensive shape was much less structured than usual. They’re accustomed to defending with two banks of four, but with the change in formation, plus Gotze and Reus told to stay higher up the pitch and concentrate on tracking the Bayern full-backs, Dortmund’s full-backs lacked protection. Bayern played a couple of fine crossfield balls, switching the play rapidly to the flanks – but neither Franck Ribery nor Thomas Muller created anything of note in the first half. By the end of the first period, Kroos was clearly the key player, afforded far too much space. On 39 minutes he picked up the ball in space in the centre of the pitch, with Dortmund’s side so disorganised in the middle that left-back Marcel Schmelzer was the player forced to close him down. Kroos sent the ball forward to Mandzukic in the channel behind the defence – in the end, nothing came of it, but his importance was clear. How long did it take Kroos to have an effect on the game in the second half from between the lines? 12 seconds. Again, it was a wayward shot over the crossbar, but Bayern simply sent a long ball downfield from the defence, Mandzukic won the header and flicked the ball back for Kroos, who volleyed over in a position in behind Bender – this time, it was right-back Lukas Piszczek forced to come across and challenge. That said, the structure of the Dortmund midfield appeared to change slightly. Bender no longer pressed Martinez, while Gundogan moved to the left when in possession, allowing Schmelzer to get forward on the overlap. There was more overlapping from both left-backs, with David Alaba trying to scamper past Gotze, contributing to a more open game. But Kroos’ positioning was still the key feature of the game – he continued to get into positions between the lines, with neither Bender nor Gundogan tracking his runs, neither Mats Hummels nor Neven Subotic stepping out to meet him, and the gap between midfield and defence unusually large considering Klopp likes his sides to stay compact. Kroos’ opening goal was a fine example – he’s in oceans of space during the build-up, and both centre-backs are forced to dive forward into unsuccessful challenges shortly before he fires into the net. Substitutions played a minimal part in the match – Heynckes only made straight swaps, while Klopp introducing Ivan Perisic for Blaszczykowski had no impact on Dortmund’s equaliser, which came immediately afterwards from a corner situation. Here, Kroos was the villain – switching off when supposed to be tracking Gotze. But Kroos was still a threat at the other end – he had one excellent chance in the 86th minute when slipped through by substitute Mario Gomez, while Muller drifted inside more to become a goal threat, but Roman Weidenfeller had a excellent game. 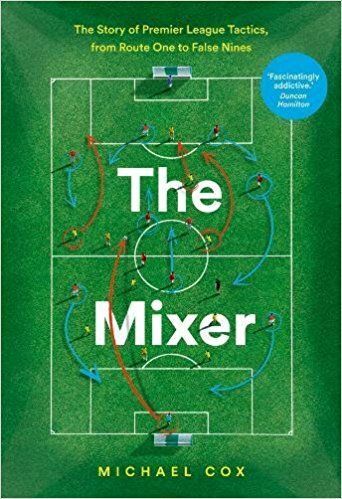 This was all about the midfield battle – Dortmund’s surprise system resulted in disorganised pressing and a less of compactness, which was chiefly exploited by Kroos. In scoring the opener, switching off for the equaliser and missing he best chance at 1-1, he was unquestionably the key player. That’s the worst tactical analysis I ever read. Dortmunds pressing was brillantly and not “disorganised”, Kroos had basically no impact during the first half. You are obviously not able to understand intelligent movement. Defending is not about standing around. We’ll have to agree to disagree. If you can explain why Bender was the one pressing Javi Martinez, therefore leaving Kroos free in so much space, I’d be very interested. Dortmund’s pressing is usually very good. In this game, it was dreadful. Far too much space between the lines, very unusual for a Klopp side. When Bender pressed Martinez (which wasn’t the case very often actually) then he did it in siutations and with a timing that made it impossible to play behind him (otherwise Kuba or Gündogan would anticipate it and would be able to run into the space, attacking the ball with speed). It was about dynamic and passing channels. Kroos played four passes during the first half in the central offensive midfield, none of them went forward. Between 13th and 45th minute he didn’t play any pass there. That stupid Bender! And of course Kuba didn’t play in the midfield there to pick up Schweinsteiger. Schweinsteiger played right sided. Kuba developed a great defensive sense during the last years under Klopp and he knows how and when he should leave his position. That intelligent movement was a key feature of Dortmunds pressing. You can leave all the space of the world between the lines if the opponent has no chance to use it. You should watch some Swansea matches. I simply don’t agree with the bit about Bender pressing Martinez. Gundogan was never in a position to cover – he was to the left of Bender, Kroos was the other side. I actually agree that Kroos had little impact in the first, say, 20 minutes. But from then on, when the game settled down, he was always free and played a bit part. I simply can’t see how you think leaving him in such space was a good idea. It was very, very unlike Dortmund and it was no surprise Kroos opened the scoring (from the expected position). And as i depicted with the link, especially (!) after the first 20 minutes Kroos had no impact at all in the centre. He didn’t play a pass in that zone for over 30 minutes. Not. A. Single. One. Actually, schweini played as high up as Kroos, sometimes higher, in the 1st half, seemed like a 4-3-3 at times. Bender presses JM, Gundogan keeps an eye on any schweini & Kuba acts as an auxilliary CM. I think Grosskreutz would have been perfect to play the role that Kuba played. Nah, certainly not a better team. Bayern were completely neutralised as they usually are vs BVB. They had absolutely nothing from the game until the very late stages despite playing pretty good. If anything, they leading goal was against the play. I also thought your analysis focus too much on Kroos free role when he was pretty marginalised figure throughout the match. Bender did an excellent job, 8km covered in only first half. In your chalkboard you focus just on the shallow center zone. Stretch the space a bit. See where Kroos did find the space? Obviously not around Benders position. When Kroos finds space in the left midfield zone, what does that have to do with Bender pressing Martinez? He still had no impact in the first half. Unfortunately my ling doesn’t work. It is the same as yours, I just stretched the space from left to right side line. It was either Bender’s o Kuba’s job to cover that space. Gundogan was on center-left position in the first half. Since there was no Gundogan there and Piszczek high up, there were Ribery, Mandzukić and Kroos to look after on that side. Bender should help Subotić and Kuba. To be fair with ZM, although he concentrated very much on just one aspect (Kroos) of this complex game, I think he is not totally wrong with his point. So I guess Dortmund were simply aware of the trade-off: shutting off Kroos most of the (all?) time completely by clever movement etc., while running the risk that whenever it failed Kroos would be in a very dangerous spot immediately. Maybe hoping that Kroos would blow such opportunities when otherwise not really involved in the game. Potentially, Dortmund can play their 4-5-1 even better, considering it is not their regular formation/system, and they just had a few competitive matches using it, if I recall correctly. Personally I thought it was excellent. I take no issue with you disagreeing, it is your prerogative and your right to have an opinion based on what you have seen. If you really think it is bad enough to complain about, then I suggest you stop visiting this website and set up a tactical blog of your own. That way you can read something you see as accurate. It’s very easy to complain, not so easy to do what ZM does, so please feel free to give it a go. Haha, nice try. I think, he actually has such a blog, just not in english. And he is very right about the intelligent movement by Dortmund. I say that as a Bayern fan. Kroos was really very mediocre in the first half, and apart from his goal and the last 10 minutes had very little time on the ball. Dortmund prevented him from getting the ball instead of pressing him. agree with you OM, actually Schweini have an awful game too, he was pressed and cant make meaningful passes all game. Surprisingly, Javi got a better game, he’s pretty save when pressed. Kroos ball protection under pressure also impressed me, it’s almost like watching Zidane in his hey day. But kudos to BVB pressing though, and Weidenfeller heroic. Your work is still one of the best around though. To be honest, I try and focus more on one or two issues these days – that’s generally been the theme in recent months. So yeah, here I thought Kroos was the key feature so looked at him. What I miss in this article why Bayern did scored ‘only’ one goal and did draw. Reading the article I got the idea Bayern totally dominated the game. Is Dortmund simply a far better side atm, where the tactics balance things out? Not really, Bayern hadnt that much chances. Ofcourse they could have scored in the last minutes and Weidenfeller was brilliant, but on the other hand the kroos goal was kind of a unusual goal (for both BVB Defense and Bayern attack that night ) and like pointed out by others he wasnt a real factor in the game, beside this. Bayern diddnt totally dominated that game. I also thought Dortmund’s defence in first half was excellent, but in such a way that it made their attack impotent. BVB were just not as dangerous as usual. It’s the same way he had them lined up against City. Yes , but in other Games against Bayern the played different. Ofcourse Robben wasnt playin, Großkreutz also on the bench. There is a lot you did not look on. Another thing is the workrate Müller and Ribery had defensivly. Ribery won 6 defensive tackles and Müller had 3 clearances in the opponent’s box – one went to the opponent but out of the danger zone. The whole was a tactical battle in which each was more afraid to loose than eager to win. Kroos was not a key in this – maybe in the result as he shot the goal and was not very eager to catch up on Goetze to prevent his. True. Reading the article you’d think Kroos ran rings around Dortmund. He was not key as it is made out to be. Plus hardly a mention of Dortmund’s attacking trio. I know you are in no way against you readers disagreeing or making further arguments to continue the conversation, but I just wanted to point out you can take credit in raising the bar in tactical coverage and awareness. Although I tend to agree with some readers here that your more recent work has left me wanting more from you, I for one would never complain because I believe your work is the reason I’m wanting more in the first place. Just wanted to thank you for this problem you have created in a way by raising the bar so high over the years. 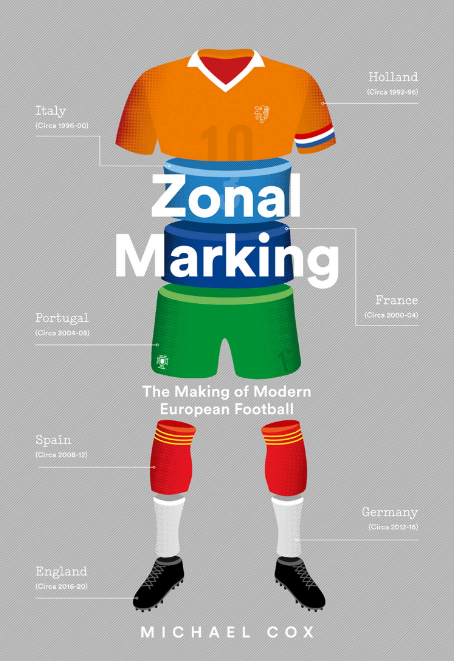 love the great work, though I tend to agree in this case that focusing on Kroos doesn’t give an accurate reflection, e.g. 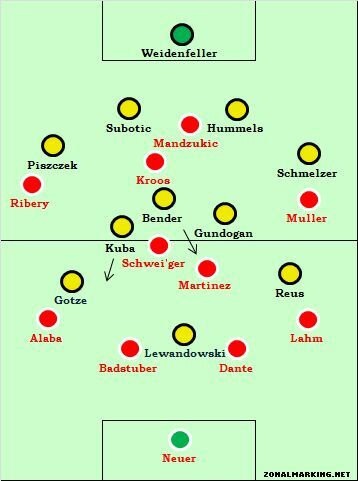 one reading of it could be that Bender and Kuba were pressing / blocking passing channels between the Bayern trio enabling Gundogan to be free to still pick up 4 tackles and 6 interceptions while being Dortmund’s most active, and accurate midfielder in possession. Best Wishes with your future work. Well, he found space because Bender pressed Martinez – that’s how they’re related.